Lovely feel good read. Alda is all about Alda. She seems to know what’s best for everyone and ends up messing everyone’s lives up. She doesn’t want her girls to go to school as she needs them with her needing her all the time. Thank goodness her husband insists they go! Jean, her sweet friend, grows in confidence as the story progresses and she is my favourite character. Enjoyed the setting and the time period. Sylvia is a Land Girl the Hoadley farm asked for to be an extra hand on the farm. Emilio and Fabrio are Italian prisoners of war sent to the farm each day to work. Fabrio falls madly in love with Sylvia. Or is he in love with a Sylvia he’s conjured up in his own mind that doesn’t really exist? Will Alda help or hurt this couple? And what of poor Maria back in Italy? Mr. Waite is a man who grew up wealthy but his family lost all their money and he was left penniless. Now he is a chicken farmer and somewhat bitter and judgemental. Then Jean came into his life. Alda thinks he is the perfect match for Jean, but Jean is in love with Mr. Potter whom she hasn’t heard from in some time. Will Jean marry Mr. Waite? Will her life with him be sad or will she be a wonderful addition to his life and change his outlook? But wait! Just when she thinks she will Marry Mr. Waite, Mr. Potter comes back into her life! What does Alda say? Can she mind her own business? Who will Jean marry? 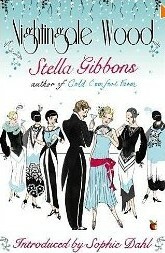 Stella Gibbons was born in London 1902 and died in 1989. She authored twenty-five novels, three volumes of short-stories, and four volumes of poetry and today is mostly known only for ‘Cold Comfort Farm’. I absolutely loved ‘Nightingale Woods‘! It was wonderfully written with lots of subtle humor and eccentric characters. 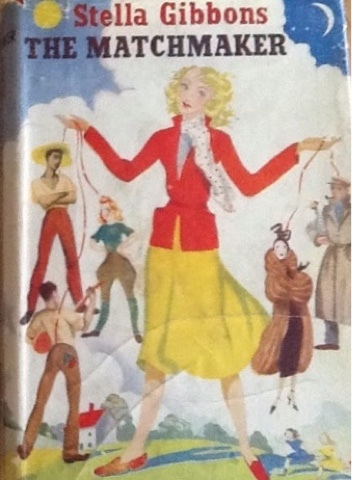 The theme of the novel is class warfare and is loosely based on Cinderella. I can’t wait to find and read ALL of Stella’s books. I highly recommend this book and this author. ‘She did not look quite a lady, which was natural; as she was not one.’ So wrote Stella Gibbons, as she introduced the heroine of her ninth book, the latterly forgotten treasure, Nightingale Wood. The not quite a lady is grey-eyed Viola Wither, a beguiling widow of twenty-one. Viola is a victim of circumstance, like so many of Gibbons’ female protagonists; a shop girl orphan, married briefly to a bumbling, bullying older man, to whom she felt unable to say no at precisely the wrong moment. In his death she is similarly muted, and when, with a sigh of middle-class duty, her in-laws, the aptly named Withers, summon her from London to live with them in their dour house in Essex, she hops on a train in her cheap black coat and pink satin blouse, meek as a sacrificial lamb. On the other side of the valley is an entirely different house, a house that sings with comfort and luxury, a house that has the feeling of ‘moving a little faster than other places, as though it were always on the brink of a party’. This is ‘Grassmere’, a polished nouveau paradise, home to the dashing Victor Spring. Victor lives with his mother, Mrs Spring, who only employs the comely because, quite simply, ‘She hated plain maids; they depressed her’, and bookish cousin Hetty, who despises the inertia of a moneyed life, believing ‘The Eagles’ across the way to contain a life full of ‘muted melancholy beauty’. Oh, the grass is always greener. Add to the cast, amongst others, a ravishing chauffeur living above the Withers’ garage, his mother, a faded village beauty with slatternly ways, a Machiavellian millionaire, a fast fairy godmother named Shirley, and a voyeuristic chorus of sorts in the form of a tramp know as ‘the Hermit’ and you have a sense of the proceedings, because Nightingale Wood is, in essence, a sprawling, delightful, eccentric fairy tale. Now, go ahead, admit it you really want to read this book, don’t you! Leave a comment and let me know if you have and what you thought of it!